Craving a robust, heavy duty set for your garden or patio? 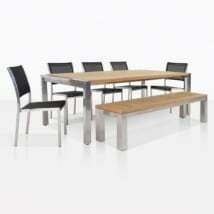 Look no further than the X Leg Table with Bench & 5 Chairs. This excellent collection is made up of a 78” X Leg A Grade Teak Outdoor Dining Table, 2 Wave Arm Chairs, 3 Wave Side Chairs and a 66” Hampton Bench; all pieces renowned for their chunky frames and classic style. 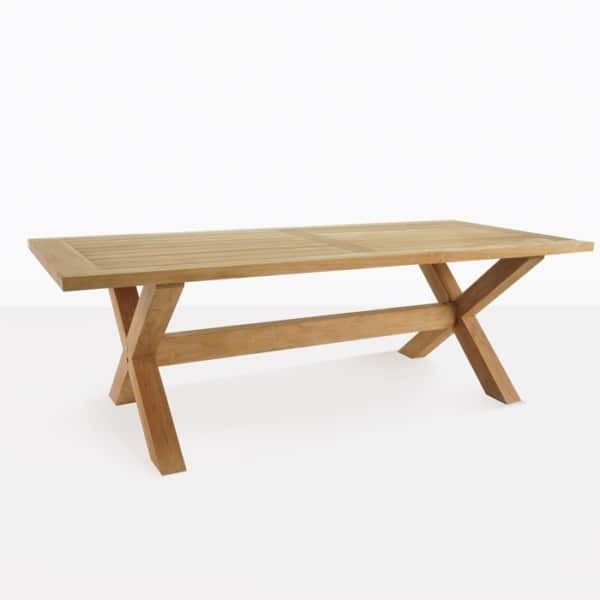 The X Leg Table with Bench & 5 Chairs set is an outdoor dining favorite. 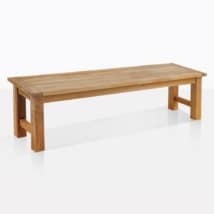 Magnificent cross leg table of chunky proportions matched with our most heavy duty chairs. 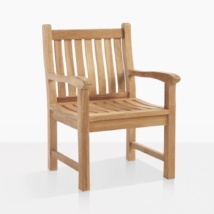 A real classic look to pair up with your garden furniture. Mix and match with one of our many different bench styles for a different look. Try out a splash of concrete for a slick and contemporary edge. 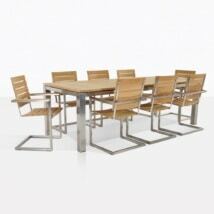 The X Leg Table with Bench & 5 Chairs dining set is assembled in the USA, no assembly required from you! 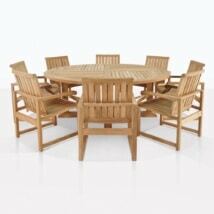 This entire dining set is made from our favorite: A-Grade Teak, the ultimate wood for outdoor furniture. 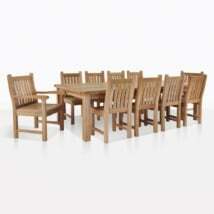 A-Grade Teak has been given the stamp of approval by architects, builders, designers and you! The proof is in our clientele – we have been in business for over 20 years because we do not disappoint! Our furniture has stood the test of time! Teak is graded based on how old the teak tree is when it is cut down – A-Grade is the highest grade the teak can achieve – it means that the wood is over 40 years old and cut down in controlled plantations, it effectively means that the wood has had time to generate its own rubber and oil content so that anything made from it will last a great deal longer than other products. Whether you choose to let the wood patina or if you seal it to preserve the honey color, we can assure you that A-Grade Teak will remain beautiful and strong. It requires very little maintenance too! Simply wash it down every few months with a un-pressured garden hose, and for stubborn dirt; a bucket full of warm water and simple green will clean it up brilliantly. Just apply the water with a sponge or brush and follow the grain of the wood to bring the oil to the surface. Your furniture will look and smell amazing! The X Leg Table with Bench & 5 Chairs dining set is a wonderful composition that suits many spaces because of its effortless, chic style. Open up your folding doors and extend your living space to the outdoors. Place your X Leg Table with Bench & 5 Chairs dining set on your veranda overlooking your ocean view, the perfect space for Saturday lunches, dinners as the sun goes down and cocktail parties. 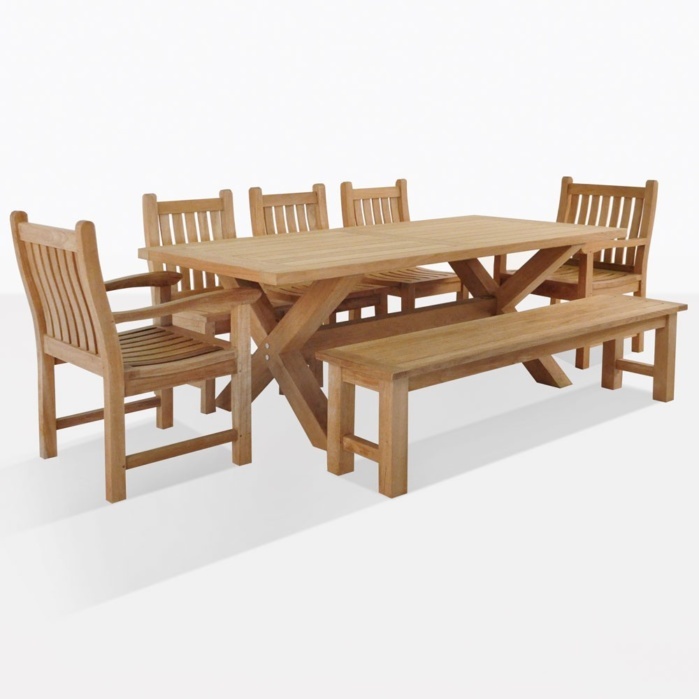 Make the most of your outdoors with this alluring, solid dining set. Imagine a lake or beach house with this fabulous, robust set anchoring the outdoor area. Let it weather and you’ll feel it has become part of the environment; a ‘built in’ place for you to enjoy the company of your loved ones while taking a step away from the busyness of day to day life! And you don’t feel tied down to what we have here! 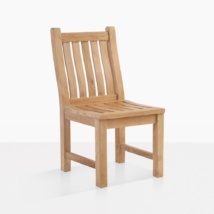 If you like the concept but perhaps the chairs aren’t right for you, we have dozens of styles of dining side and arm chairs. Or perhaps the X Leg isn’t your thing, we have the same style of table in a 4 legged variety, check out the dining tables and chairs for other options. Teak Warehouse is proud to host many different pieces of furniture and now a selection of beautiful materials, all marine grade, all proven to stand up to the elements as well as our beloved teak! Take a look into our online catalog and be amazed by the sun loungers, deep seating, relaxing units, umbrellas in a array of fabrics such as Batyline® and Textaline® mesh, Sunbrella® fabric, #316 Stainless Steel, Concrete and Reclaimed Teak. Your outdoor living experience begins here with us. 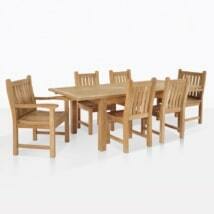 The X Leg Table with Bench & 5 Chairs dining set is in store and available now. We’d love to hear from you! Call, email or inquire online and our sales assistants will be happy to help your discover items that will improve, define and illuminate your space. We are experts in customer service and love helping our customers find combinations that are unique and exciting.